earing Dynamics is a full-service audiology practice that assists patients with all aspects of their hearing loss healthcare. Obviously, we prefer that you receive the very best in hearing care as well as hearing aids that are selected and fitted properly according to best practices and protocol including audiometric testing and Real Ear Measurements. If you purchase your hearing aids online and then later need assistance, we may or may not be able to help you. Some online hearing aids are locked and we would be unable to fit locked hearing aids to your hearing prescription or adjust them at a later date. Purchasing hearing aids online is a risk since the aids are not properly fitted to your hearing prescription and to your lifestyle. Additionally, the type of online hearing aid that you purchase may not be ideally suited to your specific hearing loss. Buying hearing aids online may appear to be a great deal at first glance until you find yourself having a “Great Deal” of problems. What happens when they don’t fit, don’t work properly or need adjusting? 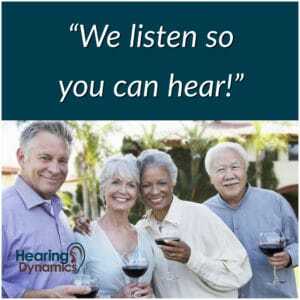 A reputable hearing company will test your hearing, check the health of your ears, make appropriate medical referrals, help you choose the best product for your hearing loss, measure your physical ear for the correct receiver lengths and perform a Real-Ear test to verify your fitting is accurate. They will continue to service your hearing instruments and provide your hearing healthcare. Hearing aids are a highly serviceable item requiring maintenance. Your experience with us will prove to be invaluable! Most manufacturers do not support the sale of hearing aids online, and some will not honor the warranties promised by an online company. You can check the manufacturer’s policy regarding online sales directly on their website. Need more convincing? Here are 10 reasons to not buy hearing aids online. Are online hearing aids the right choice? Here are some issues you should consider when deciding between online hearing aids and purchasing hearing aids from a reputable local clinic. There are very few advantages when buying hearing aids online. #1. Online hearing aids are not the “same thing” as clinic hearing aids. Often they lack standard features and have locked software limiting their usefulness & wearability. #2. Online hearing aids may be cheaper, but you don’t receive “in-office” care which is more important and valuable to you than the hearing aids themselves. You are purchasing a product without service. You then have to seek and pay for additional services from an audiologist. You will have to find a provider to refit the hearing devices to your needs, make adjustments as required and you must pay for every repair, part replacement and cleaning. Fitting hearing aids correctly without a face-to-face consultation can be very difficult. #3. The training regarding the operation, care and on-going necessary maintenance of your hearing aids is not hands-on. #4. The manufacturer warranty may be limited and there are no assurances for immediate servicing of your devices if anything goes wrong with them. If you buy your hearing aids overseas you only get a 12 month manufacturer warranty. Most hearing aids from our manufacturers come with a 3-year manufacturer comprehensive warranty for the devices. #5. Online hearing aids are not fitted or programmed to your hearing loss prescription. Determining the right hearing aids for your needs is a structured process which should take over an hour, usually an hour and half. During this consultation your hearing levels, your lifestyle needs, your individual ear shape and anatomy, your budget and your cosmetic concerns have to be taken into account. #6. Real Ear Measurements cannot be performed on-line, and this is the most critical component of treating your hearing loss. The only way to properly program a hearing aid to a hearing loss prescription is by using Real Ear Measures, and this cannot be done unless you are evaluated by a professional. #7. Be aware of “Special Software” or “Online Hearing Tests”. Some online providers promise “special software”; questionnaires or impressive looking web pages to help you find the best hearing aid, but a close examination reveals they are only electronic smoke and mirrors. No simple computer algorithm can replace the years of training, insight, experience and continued professional training you’ll get from a face-to-face consultation with our experienced audiologist. #8. Unverified qualifications and experience of the online business can lead to problems. It can be difficult to tell if an online business is reputable or not. It’s easy to make an online hearing aid business appear larger than it is by using a virtual office to handle mailing and receptionist work. When you buy your hearing aids online, that impressive looking company you bought them from may simply vanish when you need them. When you deal with a brick-and-mortar clinic there’s no doubt that you’re dealing with a substantial business with an actual street address and actual people seeing you in a real office. #9. Medical conditions may cause a hearing loss. A qualified and trained hearing professional will be able to determine if your hearing loss is an indication for medical concerns. Ear wax impaction, ear infections, otosclerosis, and certain types of cancer can all be causes of hearing loss. It takes a trained professional to tell the difference and make sure that a hearing aid is right for you. #10. Coaching and support is an integral part of learning to adjust to the sounds around you, and a trained hearing professional is the best way to ensure that you are approaching things in the right way. Hearing aids are a great tool for getting back on the road to more effective communications, but the tool only works as well as you are equipped to use it. A licensed hearing professional is the best person to teach you to use the tool properly. It’s Buyer Beware! There are a lot of unscrupulous online businesses targeting vulnerable people. That money saving bargain may turn out to be one of the most frustrating and expensive purchases you’ve ever made. Ultimately, you need to educate yourself about online hearing aids in order to make the best decision for YOU!